Professor Denis McCaldin joined the fledgling University thirty years ago as Director of Music. 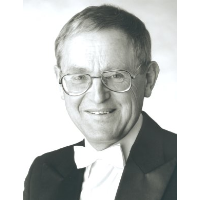 Although Lancaster University's international subscription series of concerts had been established for 2 years it was Denis who had expanded the events and the season making Lancaster Concerts a distinctive part of the cultural life of the whole region. At the same time, he was busy starting up the Music Department and appointing its first staff. He later became the UK's first Professor of Performance Studies in Music. He has arranged almost 1000 concerts in Lancaster and surrounding areas and conducted many of them himself. His contacts in the music world, his flair, wisdom and good humour will be hard to replace at the University. However, he will continue his connection with Lancaster University as he has agreed to fill the currently vacant position of President of Lancaster Concerts, following such illustrious predecessors as Sir Arthur Bliss, Paul Tortelier and Dame Janet Baker. Denis McCaldin's final concert as Director of Music will take place on 22nd of March followed by a reception and presentation. The tickets for the concert are free to friends and colleagues please contact the box office ext 93729.